Calgary took its bid for Amazon's second headquarters directly to the streets of Seattle on Thursday, the deadline for cities to submit pitches to the online retail giant. In addition to a formal bid package, the pitch involved an aggressive marketing campaign aimed directly at Amazon employees — whose votes will have an impact on the company's decision. 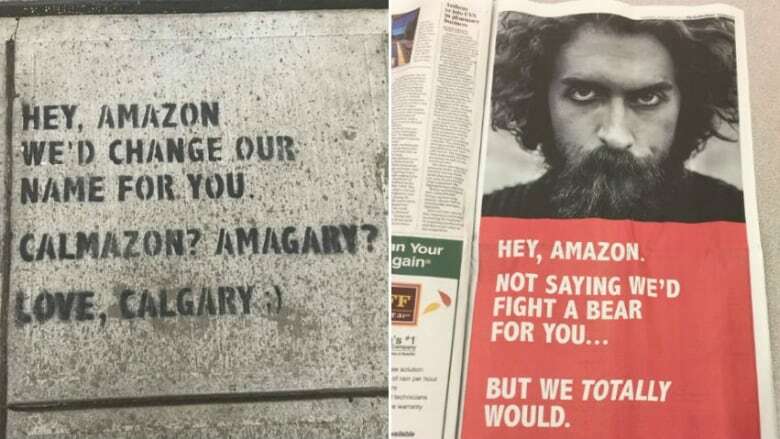 Calgary Economic Development bought a full-page ad in the Seattle Times, hung a 30-metre banner from an under-construction building and stenciled chalk messages on sidewalks around Amazon's main headquarters in the U.S. city. "We're really taking over, penetrating the Seattle market," said Mary Moran, CEO of Calgary Economic Development. 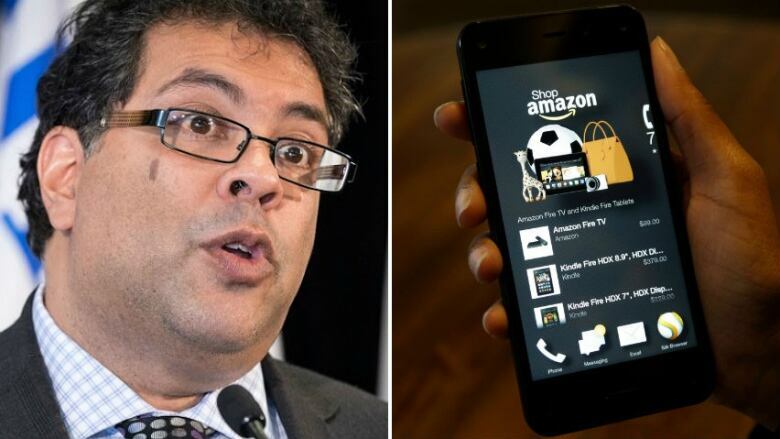 Mayor Naheed Nenshi described the overall effort as a "top-notch pitch" and said there are many reasons for Amazon to consider Canada. In particular, Nenshi noted Canada's universal health care (which means employers don't have to pay for basic health insurance premiums) and its more open immigration policy, making it easier to recruit top-end talent globally — something that has become a challenge for tech companies in the United States. "If your future is global, then your future is Canada," Nenshi said. "And once you look at Canadian cities, as you've heard, Calgary wins on all of the criteria. So we are very, very excited about this." Calgary is one of dozens of cities in the United States and Canada hoping to lure Amazon. Moran said Calgary's low crime rate, its "dark-fibre" network of high-speed digital connectivity, vast amounts of available downtown office space, talented workforce and world-class recreational opportunities in the Rocky Mountains to the west make the city highly competitive. "There are no other cities, in my mind, that have all of these things to offer Amazon on Day 1," she said. The only criteria Calgary doesn't have, according to the bid committee, is direct flights to Washington, D.C. Moran said it was lucky that the CEO of WestJet was taking part. Calgary's pitch even got Flames fans involved. Moran said Calgary can't, under provincial law, offer property-tax incentives to Amazon, as some other cities in the United States have been doing, but it has more to offer the company, financially. "Labour is their biggest cost element and the built-in incentives for coming to Calgary — which would include difference in labour costs plus health-care premiums — based on our calculation, when they are fully scaled up to 50,000 employees, could result in a $2.1-billion savings every single year," she said. "These are built-in incentives. So when you see headlines that New Jersey is offering $7 billion (in potential tax credits), you know they are trying to offset for a shortfall that they have." The massive company is promising to bring 50,000 high-paying jobs and a $5-billion US investment to the city it ultimately chooses for a second headquarters. Amazon's primary headquarters are in Seattle. Today is the deadline for submitting bids to host what's become known as Amazon's "HQ2." The Calgary bid committee thinks its biggest competition right now is Denver, Col., but believes Alberta's biggest city has a better airport, transportation and a shorter flight time to Seattle. Could data be the new oil in Calgary? Canadian cities in the hunt for Amazon's HQ2 — but is it worth the shot?